In the start of this year there were reports that Microgaming was developing a new slot game that featured Rebel Wilson, Rose Byrne and Kristen Wiig. 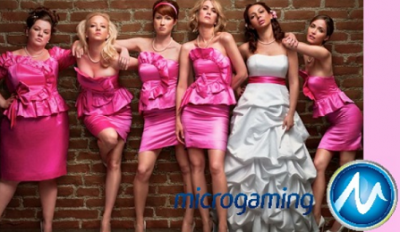 The game is called Bridesmaids slot and is based on the movie by the three actors that was released in 2011. There is good news for those who have been eager on when the game will be released as the date has been set. It is said to be released this summer on the 5TH of August this year and it will be at Crazy Vegas Casino. For those who have seen the movie or any artwork related to the movie, then the pink flair tied to the movie would be a prominent feature in the game. The game is aimed to create a Bridesmaid feel, in the game there are glittering diamonds, eye catching pick dresses being worn by the cast of the movie on which the game was developed. Microgaming has thus come up with a gaming interface that will try to factor many features as much they can. With this they try to recreate the aspects of the game as much as they can based on the movie to the slots world. The game’s new adaptation displays has much more reels on display with five on the three rows. With the forty paylines on the slots, players will therefore have an increased chances of winning with the slot machines. Added features to this include wild symbols, free spins, scatters and stacked symbols all on which come in handy with helping players on the slots. For the scatter symbols cupcakes are used, a decision that will for sure delight many players and increase their spirit for the game. In addition to this, on landing three or more of the scatter of symbols on the screen at the same time. This will unlock the wheel bonus and therefore a possibility to also win cash prizes. The fans to the movie will be pleased to see that there are amusing clips on the movie that have been included in the game and creates a much worthy feel of the movie when playing the game. This feature that will appear after you have won the game would be an extra mile in the slot arena as this has not been presented before in the licensed movie slots. There have been licensed slots released by Microgaming with the likes of Terminator 2 or Jurassic Park but none of these have added the clips to watch after a win on the slots. This feature will therefore have an appeal to many players. The game will be available at Crazy Vegas casino starting from next month.